There’s junk mail. There’s informational mail. And then there’s mail about you that contains sensitive information, like your retirement accounts detailing progress and performance. When it comes to how interested we are with the various forms of mail, I think it’s safe to say most of us toss junk mail straight to the recycling bin or trash. I personally don’t waste my time with coupons and ads from just about every business that has my address. I will, however, give informational mail a solid look-over, not wanting to miss anything potentially important. Today I’m gonna talk about informational mail. There’s no sense in discussing mail that contains sensitive information such as bills, bank or credit card statements, retirement account reports, etc., because I think most of us open these up close to 100% of the time. If you’re too busy to open these types of documents, you’re a financial idiot, and I want you to leave this site immediately! I can’t help you. However, folks, I know that there are quite a number of you who simply do not give informational mail, the type you may get from your pension provider or investment, insurance, etc., services agent, for example, that’s written for “All” members, the attention it deserves. Take my case. For like the first four years of my educator career, I never broke the seal on the semi-annual report CalSTRS sent to me. Not once! Just said to myself, I just started my career, why do I need to read about retirement?--And into the trash this colorful, graphic production went. 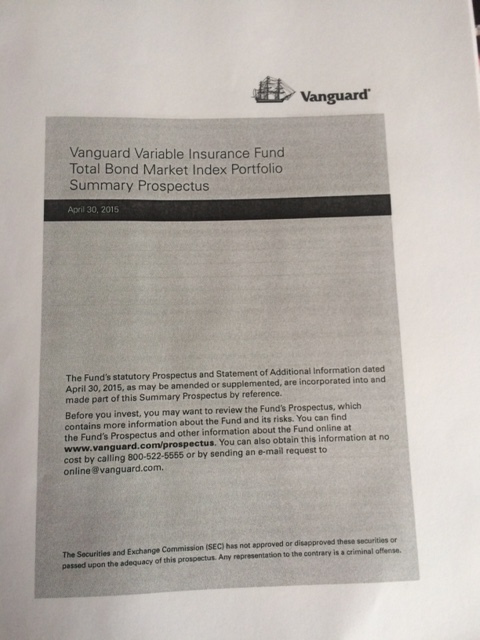 If you invest in mutual funds, you’re entitled to a Prospectus. Many of us choose the electronic option, yet the default is getting one by mail. But what’s the point, right? What happens to that mutual fund Prospectus when it comes to us in the mail, within a huge envelope entirely too hard to open? We look at the black and white cover, perhaps flip through one or two pages, and decide to put it in our stack pile of “things to finish reading” once we have more time. That’s how most people miss learning about things like fees and historical performance. And that’s why there’s a need for financial advisors and planners, to save us from ourselves...because WE DON’T READ! First paragraph from the pic above: It’s taken ten years for us to get our act together and realize we can’t fully fund every CA teacher’s retirement without raising everyone’s contributions, teachers and employers alike. Oh and by the way, we’re not saying we’ll never make any future changes (“investment assumption”) if we should see your money managers (the one’s we’ve hired with your money) underperform their benchmarks. 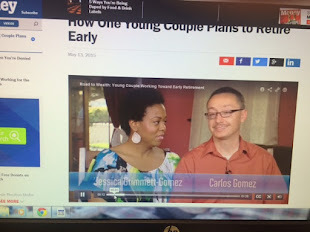 "Established a supplemental retirement savings account?" 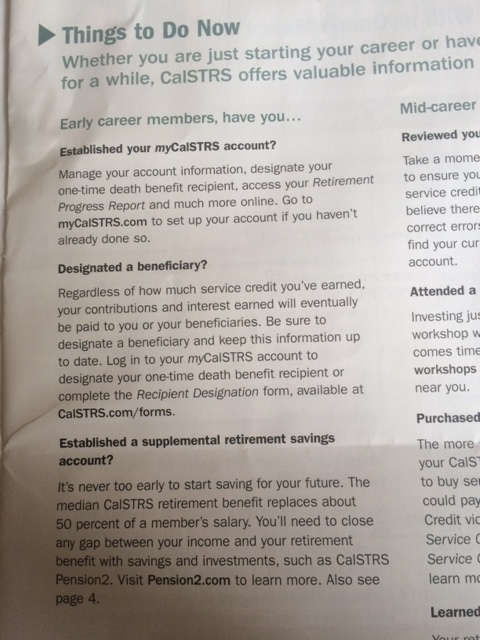 And just how does CalSTRS expect YOU to do that without having additional "funds" to put into a supplemental retirement account like a 403(b) or 457? A meager $4.99 purchase will save you tens of hours of struggling to find ways to supplement your income as a teacher. I have made it my professional life's mission to help educate teachers about retirement planning and investing, because time is of the essence, and it is a matter of high urgency. 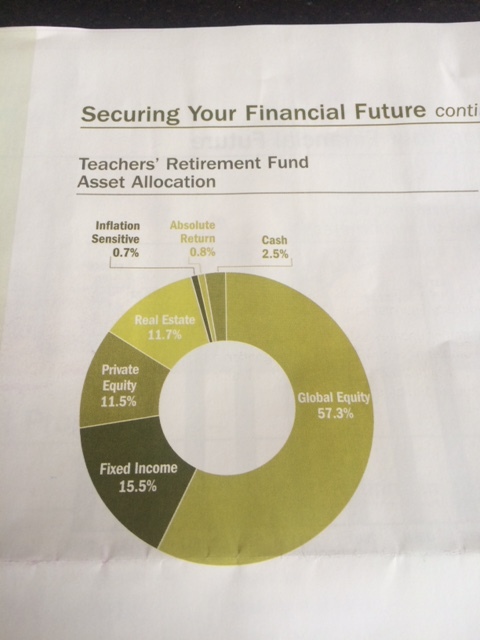 Table reflects allocation targets and ranges approved by the Teachers’ Retirement Board in September 2013. "Real Estate" = Real Estate Investment Trusts or REITs holding commercial, apartment, residential, and other types of RE assets. "Private Equity" = Hedge Funds investing in Master Limited Partnerships or MLPs, Venture Capital (funds that invest in start-ups) etc. "Inflation Sensitive" = Probably T.I.P.S. or Treasury Inflation Protected Securities, meaning government bonds that won't lose value as the rate of inflation rises. "Absolute Return" = More stocks and bonds cut up as a separate slice even though they are essentially more of the same paper assets. What grade would I give this portfolio, headed by CalSTRS Chief Investment Officer, Christopher J. Ailman? D! That's right, I'd give it a D grade. Why? Our non-U.S. Global stock holdings include shares of companies in Greece, China, and Hong Kong. I'd be a non-investor myself in anything Greek until the "Grexit" dust settles, and be looking to short the Chinese stock market. In fact, I did just that this year already for a profit! I wish I had maintained my position in FXP because the ETF continues to rise. Dang! 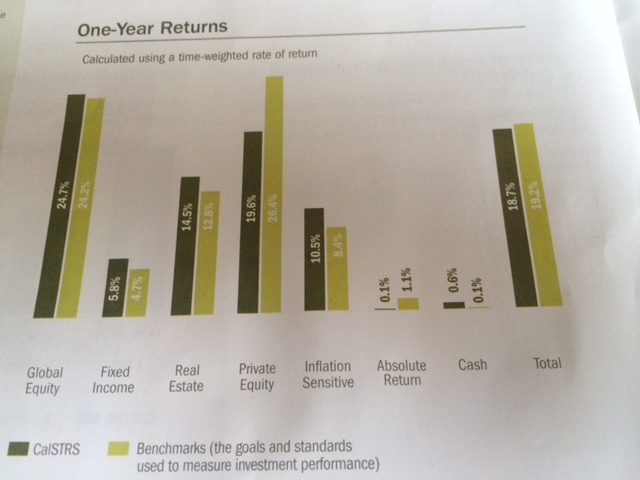 Why should CalSTRS be paying for active management when they (these hired guns) can barely match their benchmark? 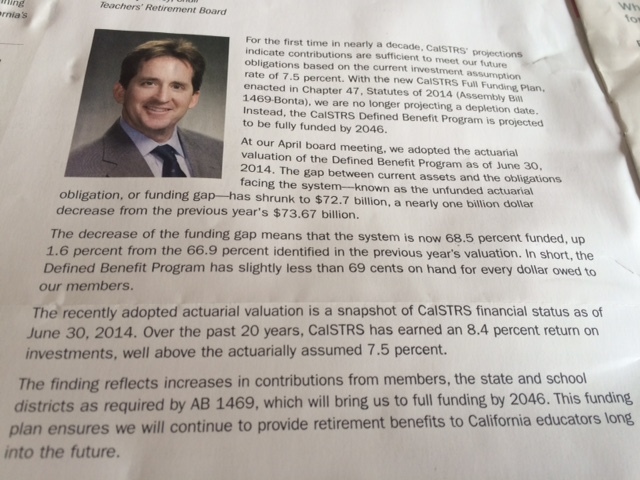 CalSTRS should follow the lead of Calpers and cut ties with fund managers to save on fees! In the case of Private Equity, CalSTRS has decided to keep it truly private. Although we are able to look at our specific holdings for all the other categories, they have withheld knowledge of who is investing $18 billion dollars of our money. I read the Private Equity Investment Policy and did not find any mention of a need to keep this information from us. You think Mr. Ailman would tell me if I asked him? Don't you want to know which hedge clubs, I mean, funds, are falling behind their benchmark to the tune of 6.8%? I do! I get that the risks inherent in private equity investments are greater than any other, and that the objective of this part of the portfolio are enhanced returns not possible in public markets, but...I still want to know the names of these players! And onto Cash. It is absolutely ridiculous that our pension fund should only currently hold a 2% cash stake! It's plain nuts, in fact. And look the "target" is actually for 1%. No, no, I do not agree. We're due for a massive correction in the bond market that will punish anyone holding mid (5+ years) and long-term (10+ years) duration maturities. The U.S. stock market, which is like the alpha wolf of all markets worldwide, is running the pack on empty, and is also like Californian's who are long-overdue for a "big one." Instead of raising cash, by selling poor performing securities perhaps, CalSTRS is looking to deplete the account even more! And watch, when the correction happens, the pension will be left with no available cash to buy the big dip or add to positions when they are on sale. No sane securities investor is ever "all in." At minimum, our pension should hold a 3-5% cash/liquidity stake. Here's a great article published on Yahoo this year that supports my point: Should you keep cash in your portfolio? 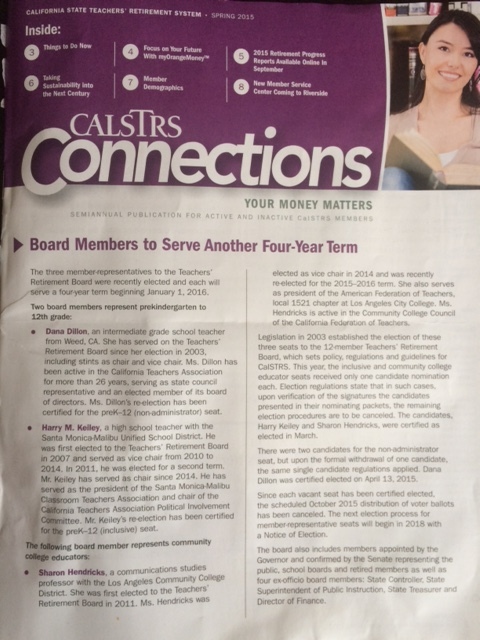 My peeps, I may need to try to get on the CalSTRS teachers' retirement board. What do you think? All kidding aside...whether you are a teacher or other professional, not reading your informational mail is dangerous to your financial well-being. Not understanding it is not an excuse either. You must try your best to figure out what is happening with your money. And don't sit around letting your pension system do whatever the hell it wants with your retirement money. Call or email someone. Other than writing this post, that's exactly what I intend to do!